Chalet Basile was a self catering chalet business situated at 1175m above the lovely market and spa town of St. Gervais-les-Bains, between Chamonix and Megeve. 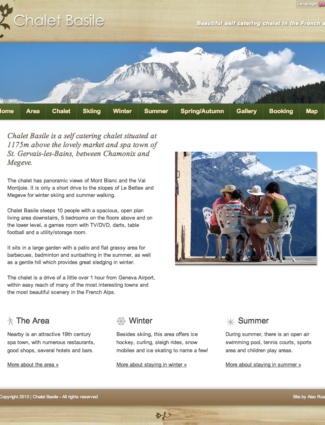 I designed and built the chalet’s website in 2010 which included a version localised in French. It included a custom location map and booking form, as well as photo gallery.